We can judge whether Fiat Chrysler Automobiles NV (NYSE:FCAU) is a good investment right now by following the lead of some of the best investors in the world and piggybacking their ideas. There’s no better way to get these firms’ immense resources and analytical capabilities working for us than to follow their lead into their best ideas. While not all of these picks will be winners, research shows that these picks historically outperformed the market when we factor in known risk factors. Is Fiat Chrysler Automobiles NV (NYSE:FCAU) a buy here? Hedge funds are in an optimistic mood. The number of long hedge fund positions improved by 4 recently. FCAU clearly wasn’t one of the most popular stocks among hedge funds, but we may see a different picture when we compare its popularity against similarly valued stocks. The company’s North American unit, FCA US LLC, announced Nov. 1 that aggregate sales in October rose 16% year over year to 177,391 units, with fleet sales accounting for 20% of the total volume. Retail sales were 141,200 vehicles. Sales of the Jeep brand and Ram brand rose 9% and 14%, respecitvely. The automaker also logged a year-over-year 21% sales increase for its Chrysler brand, 38% in its Dodge brand, and 44% in its Alfa Romeo brand. The Fiat brand though lost steam, dropping 35% to 1,151 vehicles from the equivalent period in 2017. In today’s marketplace there are many gauges stock market investors have at their disposal to appraise stocks. A pair of the most under-the-radar gauges are hedge fund and insider trading moves. We have shown that, historically, those who follow the best picks of the top investment managers can trounce the broader indices by a very impressive margin (see the details here). We’re going to take a look at the fresh hedge fund action regarding Fiat Chrysler Automobiles NV (NYSE:FCAU). What does the smart money think about Fiat Chrysler Automobiles NV (NYSE:FCAU)? Heading into the fourth quarter of 2018, a total of 33 of the hedge funds tracked by Insider Monkey were long this stock, a change of 14% from the second quarter of 2018. 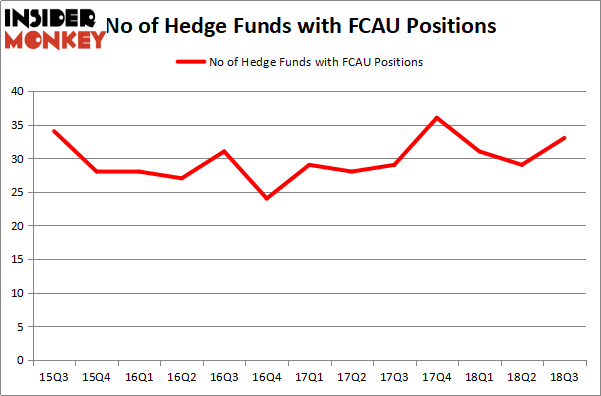 The graph below displays the number of hedge funds with bullish position in FCAU over the last 13 quarters. So, let’s see which hedge funds were among the top holders of the stock and which hedge funds were making big moves. 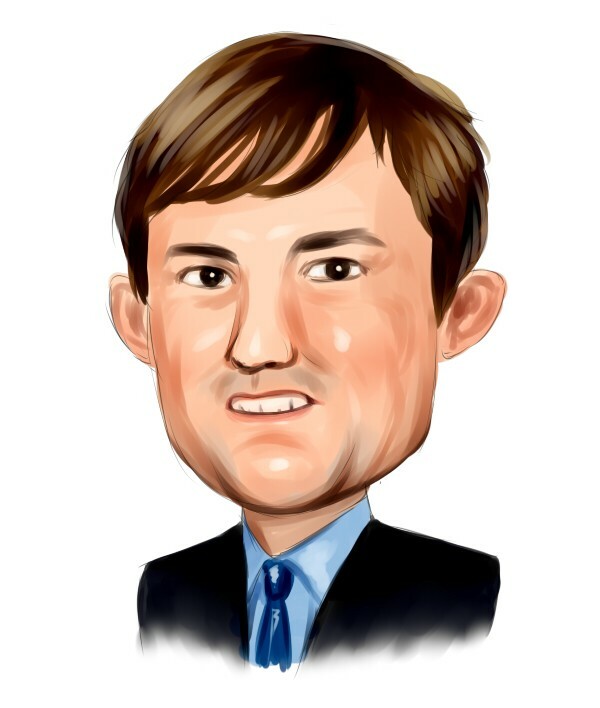 According to publicly available hedge fund and institutional investor holdings data compiled by Insider Monkey, Chase Coleman’s Tiger Global Management LLC has the most valuable position in Fiat Chrysler Automobiles NV (NYSE:FCAU), worth close to $1.0886 billion, amounting to 5.2% of its total 13F portfolio. The second most bullish fund manager is AQR Capital Management, led by Cliff Asness, holding a $270.7 million position; the fund has 0.3% of its 13F portfolio invested in the stock. Other members of the smart money that are bullish consist of Mohnish Pabrai’s Mohnish Pabrai, and John Overdeck and David Siegel’s Two Sigma Advisors. With a general bullishness amongst the heavyweights, key hedge funds have been driving this bullishness. Water Street Capital, managed by Gilchrist Berg, assembled the largest position in Fiat Chrysler Automobiles NV (NYSE:FCAU). Water Street Capital had $17.5 million invested in the company at the end of the quarter. David Fiszel’s Honeycomb Asset Management also initiated a $8.8 million position during the quarter. The other funds with brand new FCAU positions are Arnaud Ajdler’s Engine Capital, Noam Gottesman’s GLG Partners, and Jonathan Soros’s JS Capital. Let’s also examine hedge fund activity in other stocks similar to Fiat Chrysler Automobiles NV (NYSE:FCAU). These stocks are The Allstate Corporation (NYSE:ALL), Canon Inc. (NYSE:CAJ), Autodesk, Inc. (NASDAQ:ADSK), and Ferrari N.V. (NYSE:RACE). This group of stocks’ market valuations resemble FCAU’s market valuation. As you can see these stocks had an average of 33.5 hedge funds with bullish positions and the average amount invested in these stocks was $1771 million. That figure was $2254 million in FCAU’s case. Autodesk, Inc. (NASDAQ:ADSK) is the most popular stock in this table. On the other hand Canon Inc. (NYSE:CAJ) is the least popular one with only 8 bullish hedge fund positions. Fiat Chrysler Automobiles NV (NYSE:FCAU) is not the least popular stock in this group but hedge fund interest is still below average. This is a slightly negative signal and we’d rather spend our time researching stocks that hedge funds are piling on. In this regard ADSK might be a better candidate to consider a long position. Hedge Funds Continue to Pile Into This Stock, Which Has Gained 667% in 2018 Hedge Funds Aren’t Buying the Hype Around AeroVironment, Inc. (AVAV)&#... Hedge Funds Took Their Stunning Profits and Ditched Axon Enterprise, Inc. (... Hedge Fund Ownership of FMC Corp (FMC) Has Flatlined Hedge Funds Soured on This Chinese Internet Giant in Q3 Apollo Global Management LLC (APO): Could It Hit $52 Per Share by 2020?